"Kids will really love these peanut chocolate candies." Lightly grease a 9x13 inch baking dish. In a medium saucepan over low heat combine chocolate chips and milk and stir until chips are melted and mixture is smooth. Meanwhile, combine the marshmallows and peanuts in a large bowl. 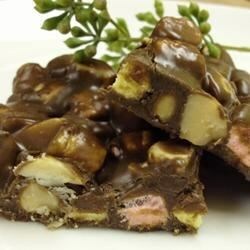 When chocolate mixture is heated, pour melted mixture over marshmallows and nuts and mix all together. Pour mixture into the baking dish, cover and refrigerate to chill for 2 hours. These took what, two minutes to make? Oh wow, they were so great! Used milk chocolate chips, and fat free condensed milk (like it even matters).